A friend sent me this pdf file, proclaiming the glories of the the month of Damodara or Kartika. Click on the following link to view or save it to your computer. 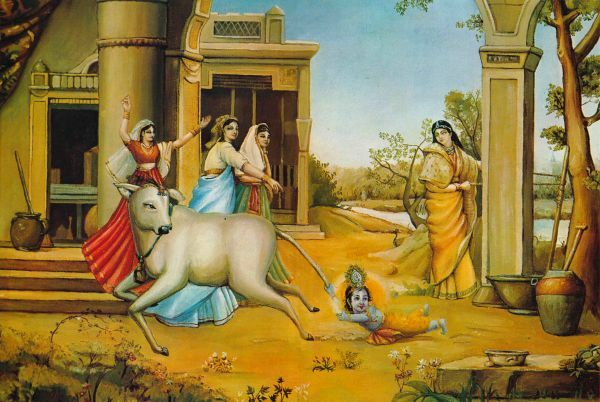 …Mother Yaśodā chased Him to all corners, trying to capture the Supreme Personality of Godhead who is never approached even by the meditations of great yogīs. 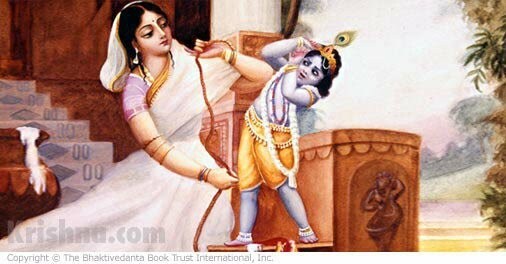 In other words, the Supreme Personality of Godhead, Kṛṣṇa, who is never caught by the yogīs and speculators, was playing just like a little child for a great devotee like mother Yaśodā. Mother Yaśodā, however, could not easily catch the fast-running child because of her thin waist and heavy body. Still she tried to follow Him as fast as possible. Her hair loosened, and the flower in her hair fell to the ground. Although she was tired, she somehow reached her naughty child and captured Him. 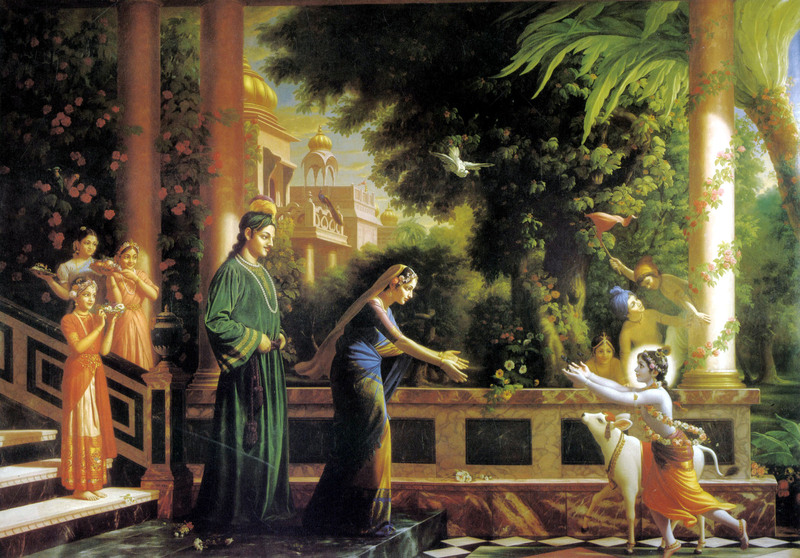 When He was caught, Kṛṣṇa was almost on the point of crying. He smeared His hands over His eyes, which were anointed with black eye cosmetics. The child saw His mother’s face while she stood over Him, and His eyes became restless from fear. Mother Yaśodā could understand that Kṛṣṇa was unnecessarily afraid, and for His benefit she wanted to allay His fears. …O Lord, the cheeks of Your blackish lotus face, which is encircled by locks of curling hair, have become reddened like bimba fruit due to Mother Yasoda’s kisses. What more can I describe than this? Millions of opulences are of no use to me, but may this vision constantly remain in my mind. This eight sloka prayer is sung morning and evening during the month of Damodara, or Kartika and which begins today. Nārada then said, "Yes, you shall become trees, arjuna trees, and you will stand at the courtyard of Nanda Mahārāj. 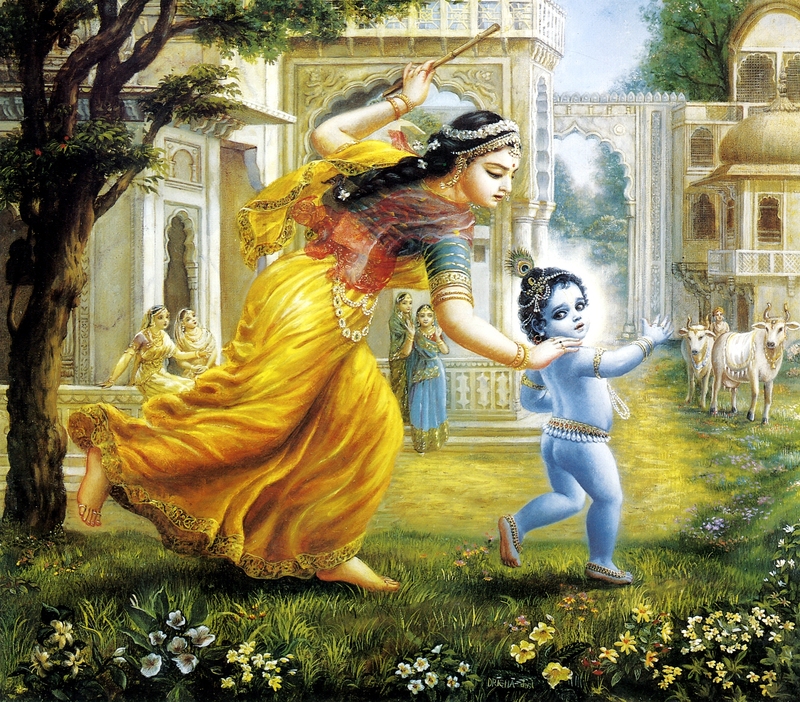 But Kṛṣṇa Himself will appear in time as the foster son of Nanda, and He will deliver you." 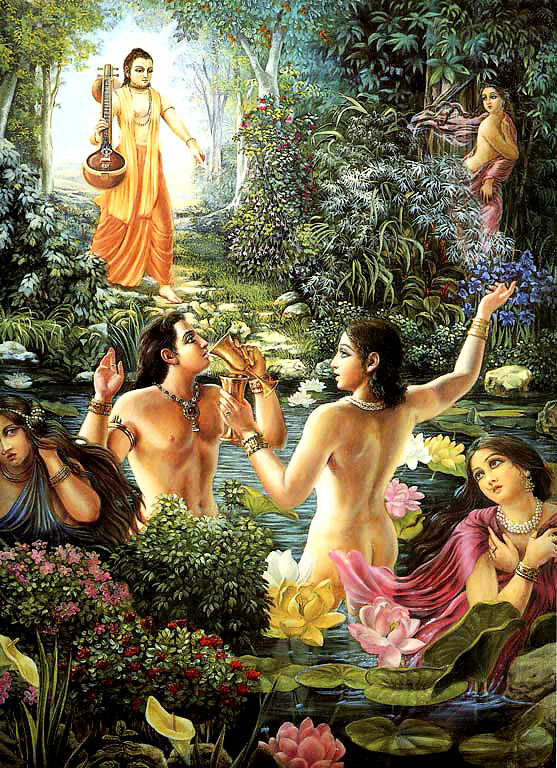 The story behind the two sons of Kuvera, Manigriva, and Nalakuvera, is they were puffed up on account of the opulence of their father, and so once on a heavenly planet they were enjoying themselves in a lake with some naked damsels of heaven. At that time the great saint Nārada Muni was passing on the road and was sorry to see the behavior of the sons of Kuvera. Seeing Nārada passing by, the damsels of heaven covered their bodies with cloth, but the two sons, being drunkards, did not have this decency. Nārada became angry with their behavior and cursed them thusly: “You have no sense, so it is better if you become trees instead of the sons of Kuvera.” Upon hearing this, the boys came to their senses and begged Nārada to be pardoned for their offenses. Nārada then said, “Yes, you shall become trees, arjuna trees, and you will stand at the courtyard of Nanda Mahārāj. But Kṛṣṇa Himself will appear in time as the foster son of Nanda, and He will deliver you.” In other words, the curse of Nārada was a benediction to the sons of Kuvera because indirectly it was foretold that they would be able to receive the favor of Lord Kṛṣṇa. 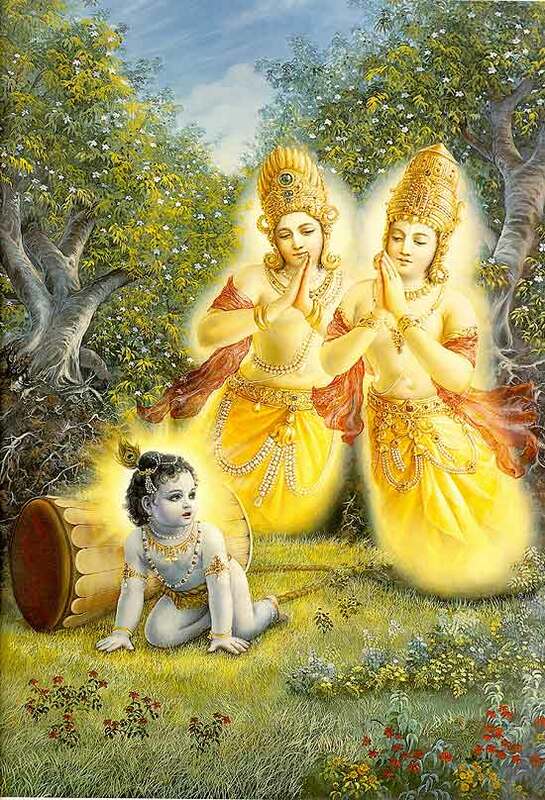 After that, Kuvera’s two sons stood as two big arjuna trees in the courtyard of Nanda Mahārāj until Lord Dāmodara, in order to fulfill the desire of Nārada, dragged the milling pestle to which He was tied and struck the two trees, violently causing them to fall down. From out of these fallen trees came Nalakūvara and Maṇigrīva, who had by then become great devotees of the Lord. 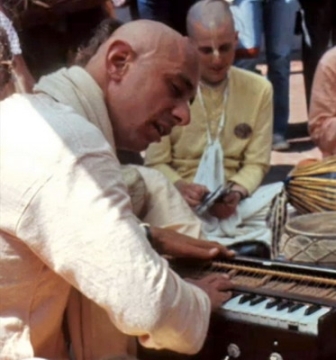 The impersonalists desire to merge into the existence of the Supreme, but without keeping their individuality they have no chance of hearing and chanting the glories of the Supreme Lord. Because they have no idea of the transcendental form of the Supreme Lord there is no chance of their chanting and hearing of His transcendental activities. In other words, unless one is already beyond liberation, one cannot relish the transcendental glories of the Lord, nor can one understand the transcendental form of the Lord. You then freed the sons of Kuvera, Manigriva, and Nalakuvera, who were cursed to stand as trees, and You gave them the chance to become Your devotees. 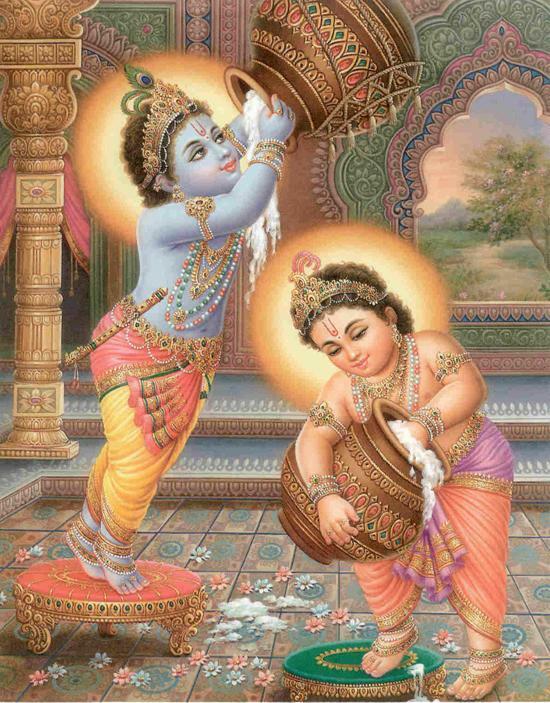 kuvera-ātmajau–the two sons of Kuvera (named Nalakūvara and Maṇigrīva); baddha-mūrtyā-eva–by He whose divine form was bound with ropes to the grinding mortar; yat-vat–since they were like that (cursed by Nārada to take birth as twin arjuna trees); tvayā–by You; mocitau–they who were liberated; bhakti-bhājau–the recipients of devotional service; kṛtau–You made them; ca–also; tathā–then; premabhaktim–loving devotion; svakām–Your own; me–unto me; prayaccha– please give; na mokṣe–not for liberation; grahaḥ–enthusiasm; me–my; asti–is; dāmodara–O Lord Dāmodara! ; iha–this. 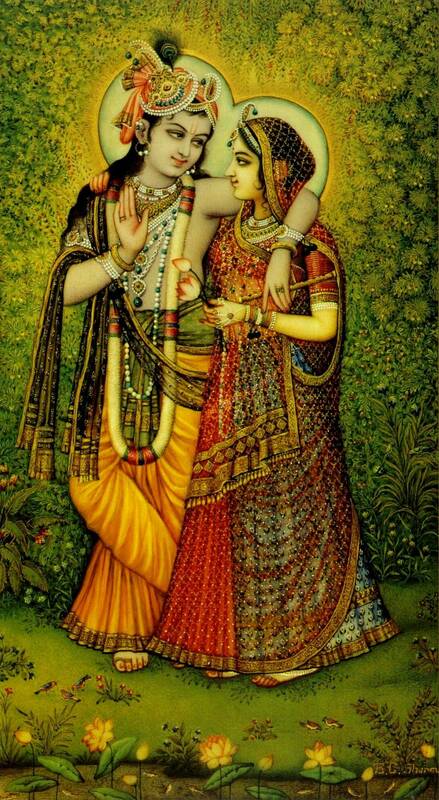 This verse reveals deep truths about prema-visesa, pure ecstatic love for Krishna. Beginning with kuveratmajau, the two sons of Kuvera are introduced. They were able to obtain the direct vision of the Lord. 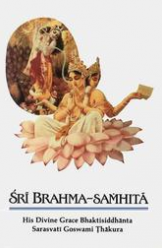 But isn’t prema-bhakti the only means for seeing the Lord face to face? And having once seen the Lord, doesn’t the agony of separation set in upon losing that vision? This is the feature of prema-bhakti that brings the Lord under the sway of the pure devotee’s love. How did the two reprobates get such mercy? 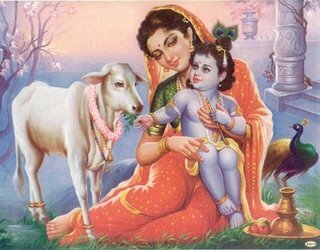 The answer is that by the quality of Sri Krishna’s love, bhakta-vatsala, the impossible becomes possible. To honor the word of His pure devotee Narada Muni, who gave the benediction that they would see the Lord face to face, the Lord actually delivers these two brothers. Did they ever do anything to deserve this? No. It is simply causeless mercy! idam–this; te–Your; mukha-ambhojam–lotus-like face; avyakta-nīlaiḥ–by very dark blue; vṛtam–surrounded; kuntalaiḥ–by curling locks of hair; snigdha–soft and glossy; raktaiḥ–by reddish-tinted; ca–also; gopyā–by the gopī (Srī Yaśodā); muhuḥ–again and again; cumbitam–kissed; bimbarakta-adharam–with lips red as the bimba fruit; me–my; manasi–in the heart; āvirāstām–may it be manifest; alam–useless (there is no need for me); lakṣa-lābhaiḥ–by millions of attainments of other boons. The poet demonstrates in this verse that longing for the association of the Lord in the heart is the best means to achieve Him. The longing to see the beautiful lotus face of the Lord, which is supremely enchanting, is stated first (idam te mukhambhojam). The indescribably sweet face of Sri Krishna resembles a lotus flower in full bloom. Simply by seeing His face, which is the treasure house of supreme bliss, all anxiety and distress disappear. Both verses four and five describe the poet’s innermost desires, beginning with, varam, boons. No benedictions of any kind are requested even here in Vrindavan (lila) from He who can bestow any boon (varesad). Satyavrata Muni does not seek liberation (moksa na), nor does he desire the highest conception of liberation (moksa-avadhim), which is eternal life in Vaikuntha. Neither is he interested in any other benediction (na ca anyam), referring to the nine processes of devotional service, beginning with sravanam kirtanam, and the benefits they bestow. If others desire these, or even if Krishna wants to bestow these upon him, he has no attraction for them. The three benedictions referred to – moksa (liberation), moksavadhim (eternal life in Vaikuntha), and anyam (any other boon) – reflect an ascending order of superiority. 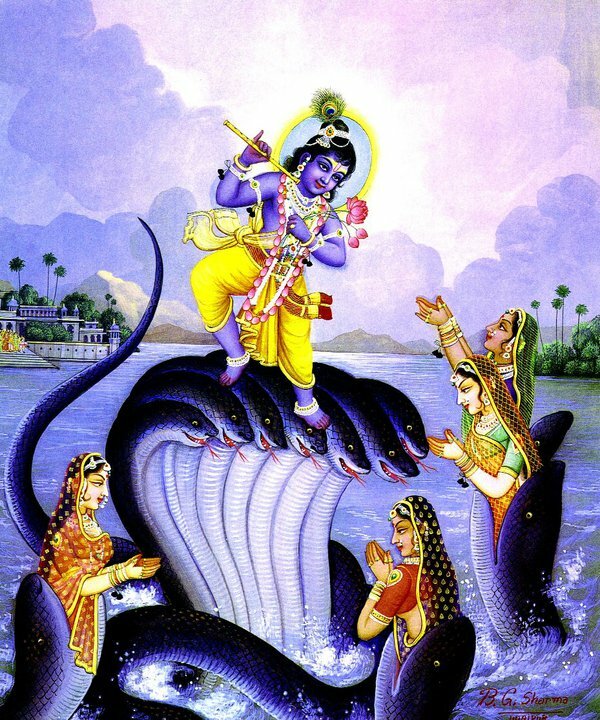 Eternal life in Vaikuntha is clearly superior to impersonal liberation. The position of other boons, such as the nine processes of devotional service, are described in Srimad Bhagavatam. “O Lord, we pray that You let us be born in any hellish condition of life, just as long as our hearts and minds are always engaged in the service of Your lotus feet, our words are made beautiful [by speaking of Your activities] just as Tulasi leaves are beautified when offered unto Your lotus feet, and as long as our ears are always filled with the chanting of Your transcendental qualities.” Srimad Bhagavatam 3.15.49. Mother Yasoda bound His belly with ropes, He shivered in fright and His pearl necklace shook. rudantam–crying; muhuḥ–again and again; netra-yugmam–His two eyes; mṛjantam–rubbing; kara-ambhoja-yugmena–with His two lotus-like hands; sa-ātańka-netram–with very fearful eyes; muhuḥ–again and again; śvāsa–quick breathing and sighing; kampa–trembling; tri-rekhaańka-kaṇṭha–neck marked with three lines (just like a conchshell); sthita–situated; graiva–pearl necklaces and other neck-ornaments; dāma-udaram–unto He with a rope around His belly; bhakti-baddham– who is bound by devotion. The second verse continues describing the lila-visesa. 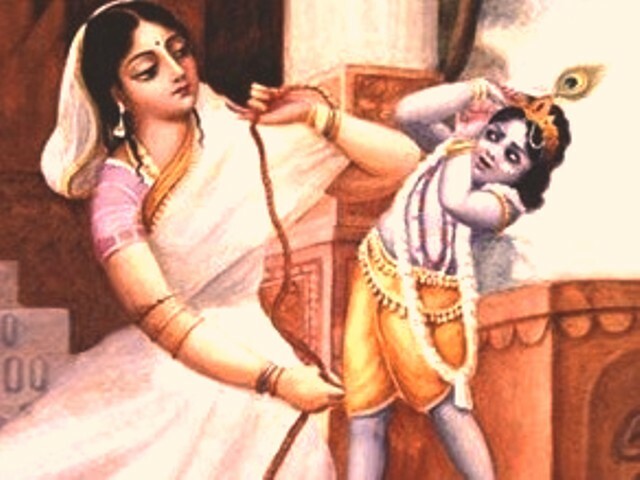 He is crying (rudantam) because He sees the stick in Mother Yasoda’s hand. Perceiving that she may strike Him, He appears fearful, hoping her natural empathy may save Him from punishment. Due to fear, tears are forming in His eyes, so He rubs his eyes with his lotus-like hands in the normal manner of children to wipe away the tears that are beginning to flow.